I batted around the idea of making this a map building exercise where kids when create a poster of how they would get somewhere to acquire a given good. It was suggested that it could be turned into a game with a board, rules and such. I debated whether I should take the leap of developing guidelines, rules, a board and what not. I mentioned to my mom that I was thinking about maybe creating a board game as a lesson plan. 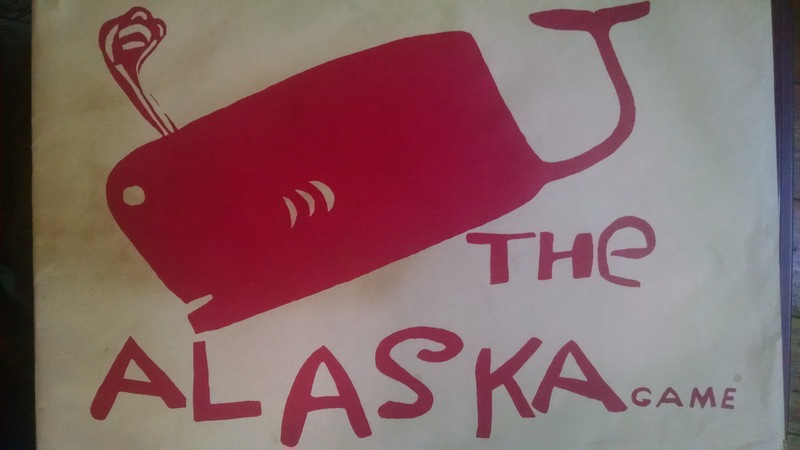 She quickly dug out a rather large envelope with big red print that read: the ALASKA game which was created by Capital School back in 1972. It looked like a fun project and you could see the children’s input clearly in the action cards. 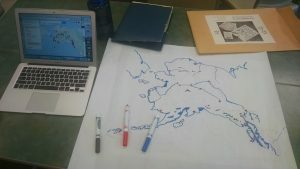 With the Alaska game as a rough blue print to s tructure my game, I literally traced the outline of the game board onto my own poster board and began tinkering and playing with my map. I also made a MyMap to help guide me and future players. Culturally-knowledgeable students demonstrate an awareness and appreciation of the relationships and processes of interaction of all elements in the world around them. I have slowly started to incorporate the Yup’ik language. In the rule book, I reference Maurluq as grandma once, then continue to refer to her in Yup’ik. Keeping words alive through use on an everyday level is key to building solid Cultural Standards. We should not simplify with translations back to English every time a Yup’ik word is seen. I have set the game in pre-contact Alaska to focus on the trade routes that the indigenous people created. After all, English was not spoken anywhere in the world for much of the time period this game takes place. The process of this lesson plan has been very exciting. While sharing my lesson plan with a few cohorts, they have made some very interesting suggestions for future versions of this game that could also be linked to different lessons. The possibilities are vast. I also asked a team member to play an early version of the game to see how it would flow. The work in progress approach helped structure the game after just a few hands. We had a few rounds gathering resources on the hunt and slowly exploring the map. On his last roll, he decided to visit his father’s visit because he missed him. The game should retain some of this loose structure where players are traversing over the country and exploring waterways of their choosing. And though it does take place potentially thousands of years ago, I did not get bogged down with the details of images I used in MyMaps. Part of the game, is seeing how it evolves. As a lesson, where can we see our class go with this? What would the group like to add that was missing? What time periods can we incorporate to bring to light an ever-changing cultural landscape? What resources were not included that should be? Who knows perhaps as a class they could create the next big role playing board/game or online gaming craze? Looking back at the Capital School’s big “the Alaska Game”, I see that it is more than possible. 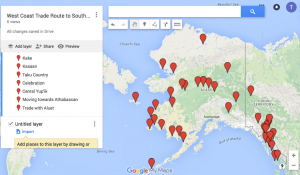 Cool use of Google Maps in the adaptation of The Alaska Game. It’s an interesting thing to think about. Would I really want to travel by beast? How much smaller would my potential field/zone of travel be? Would I really still want to live where I live? Hmmmm. Also, that game map looks awesome! Alaska Monopoly. 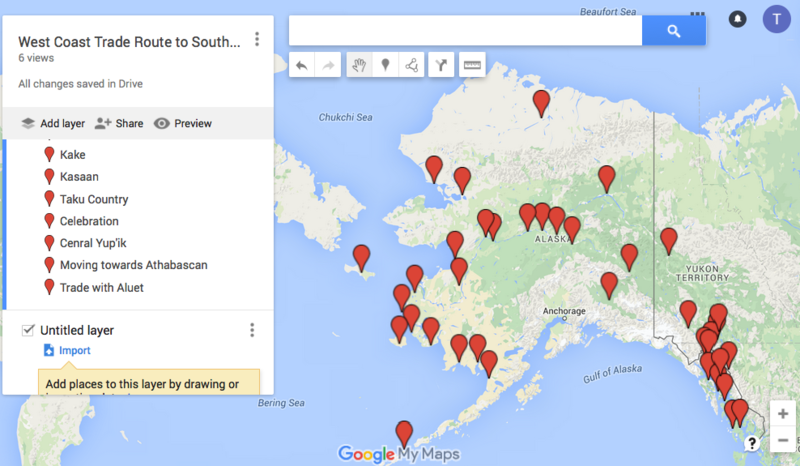 Rather than using a boring old square to move objects around, Alaska map appears to be perfect. 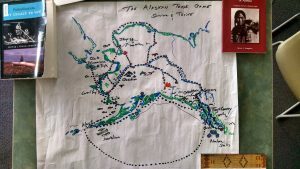 No matter where you teach in Alaska, this game will undoubtedly be helpful in increasing a student’s knowledge about Alaska geography. They might even hear about places they have never even heard about. When I heard you mention your idea, I was immediately jealous: traveling, trade routes, geography and the intermingling of Alaska’s indigenous cultures. I definitely like the idea of using native language names as much as possible – it should help transport the player into the deep time of the game’s setting, add another level of intellectual activity and finally honor the cultures that the player travels through. Good job. Oregon Trail watch out. Tyler, I think your idea of a game as part of your lesson is a great idea. This will be much more interactive and memorable to students in the long run. I also think it is brilliant to switch to the Yup’ik words after first introducing them once in English. This is one way to bring in words and phrases a little at a time. We try to do the same thing when teaching the Lingit language. If the heritage language is always translated into English every time, then there is no need to try to understand what the unknown words or phrases are. Likoodzí! Do you know what this Lingit word means? Should I tell you every time I say it? Will you keep the Lingit word or its meaning in your memory bank if there is no need to know the word if it is always translated? I love looking at maps before european colonization of the world. My favorite part of Alaskan history is that of which is pre-european contact. 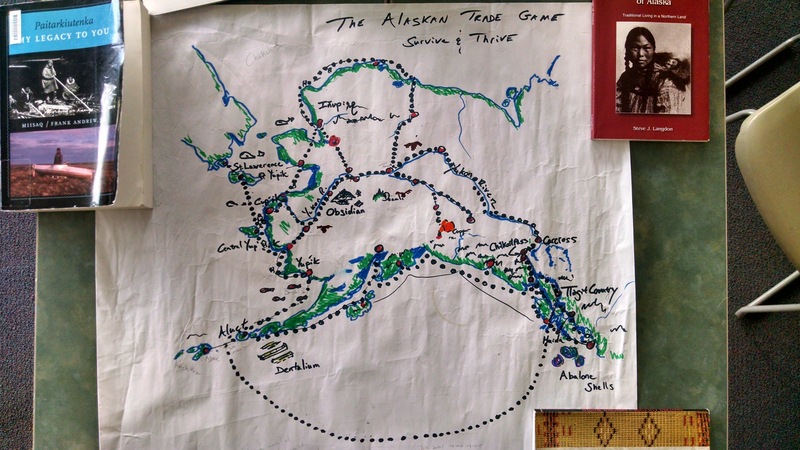 I love how this lesson addresses how trade, resources and geography effect indigenous cultures of Alaska. Actually the best part about this is it is a game! This sounds awesome! What a fantastic idea, and what a good way to make use of MyMaps. I’m sad I didn’t get to help test the game, as it sounds really fun and also genuinely educational. Tyler-this is a super cool lesson plan that will get your students interested right off the bat. I can’t wait to hear how it goes! I had to read this because your lesson plan is insane and awesome. It would be cool if you continued developing it – I’d like to see where it goes. I enjoyed brainstorming the iBook presentation with you, too.